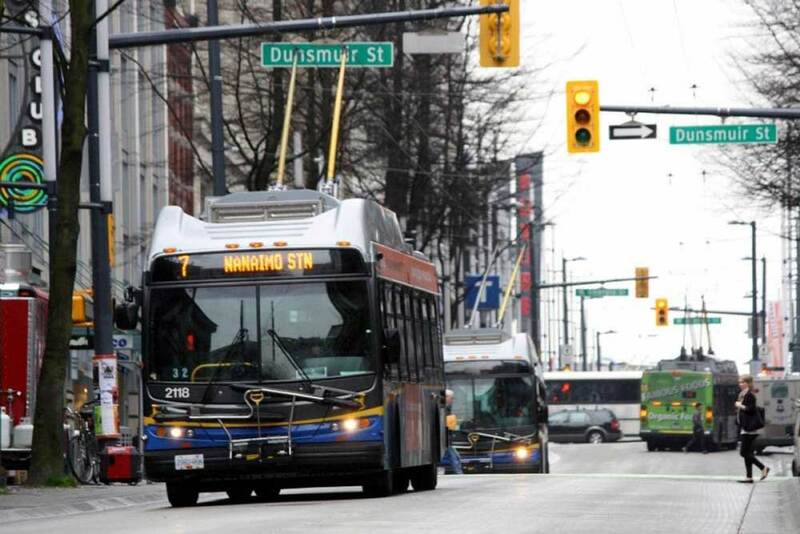 Op-ed: TransLink’s renewable energy leadership a model for bus fleets throughout B.C. Written by Alex Boston, Executive Director, Renewable Cities. This op-ed originally appeared in the October 11, 2018 edition of the Georgia Straight. Most Metro Vancouverites are accustomed to the sights, smells, and sounds of the streets. Diesel plumes, grinding engines. Call it life in the urban jungle. TransLink, for its part, made an important decision that will go a long way towards enabling clean transport, clean air, and quiet streets. Last Thursday (October 4), TransLink’s board voted to shift its operations towards 100 per cent renewable energy by 2050. There’s a powerful business case behind the strategy, which will benefit the taxpayer while cutting air pollution and protecting our global climate. Moreover, TransLink’s leadership can provide a model for the government of British Columbia as it seeks to accelerate a clean transportation agenda. Such an agenda will be required for the province to have a hope of meeting its increasingly harder to reach greenhouse gas emissions targets. For TransLink to reach its energy goals, the transit operator will need to electrify a much larger share of its bus fleet and transition to renewable fuels for buses on longer highway routes. Doing so would support its goal of reducing GHG emissions 80 percent by 2050. But TransLink’s leadership isn’t just about clean air, quieter streets and fighting climate change—it’s also about cost savings. The cost of batteries are expected to drop 50 percent in 10 years; soon, electric battery buses will reach cost parity with conventional buses. True, the upfront costs of battery electric buses are high, after all, the required charging infrastructure doesn’t come cheap. But over time, TransLink’s strategy will see significant savings in fuel and maintenance expenses. The net savings associated with fleet electrification are estimated to be in the range of $24 million to $50 million annually. Good for the taxpayer and for reducing pressure on transit fares. Given the recent LNG investment announcement for British Columbia, the majority of the province’s carbon budget will be spent on the fossil fuel industry. With this in mind, British Columbia’s transportation sector needs to move to zero-emissions ASAP. While TransLink’s transit fleet contributes modestly to total air and climate pollution, its 100 per cent renewable energy strategy can accelerate market transformation across B.C.’s total bus fleet. TransLink has generated a roadmap that can be used to guide B.C.’s new transit agenda, currently being updated as part of the clean growth strategy. The government of British Columbia now has to step in to support TransLink’s plans, using it as a template to decarbonize major bus fleets in B.C.—for transit operators like BC Transit, as well as for school, tour, charter and intercity buses. Doing so will be necessary so that the province can meet its 2030 climate targets. TransLink’s renewables shift is laudable, but it’s only one piece of the transportation puzzle in Metro Vancouver. Road transportation is Metro Vancouver’s single largest source of transportation GHGs, and represents B.C.’s most stubborn greenhouse gas sector. For its part, TransLink’s carbon pollution is only responsible for around one percent of the region’s transportation greenhouse gas emissions. We need a course correction, namely, collaboration between the provincial government and municipalities across Metro Vancouver to meet shared greenhouse gas emissions reduction targets. The $8.5 billion Mayors’ Transit Vision will see both personal transportation carbon pollution and traffic congestion continue to rise. Part of the solution to this quandary is to tie transit investment commitments with more sustainable land-use planning. This approach is necessary across all of B.C.’s big urban regions. Personal transportation GHGs are, in fact, growing even more rapidly in the greater urban regions of Victoria, Nanaimo, Abbotsford, Chilliwack, Kelowna, and Abbotsford. Reductions in driving times and GHGs could be further deepened with a cost-based driving system such as pay-as-you-drive insurance options. Not only does pay-as-you-drive insurance provide an incentive to reduce driving, it more fairly and equitably finances the risks associated with driving distance. Alongside conventional insurance packages, opt-in pay-as-you-drive schemes are being phased in by jurisdictions, such as Ontario. The mobility pricing solutions being promoted by the TransLink Mayors’ Council, Metro Vancouver, and TransLink would have a similar impact on driving patterns. TransLink’s renewable energy leadership is commendable. We’re going to need more of it to clean up British Columbia’s transportation sector. The transit operator can’t go it alone, the task will require support and collaboration between all three levels of government. The net result of this work will pay dividends; transportation is one sector where environment and economy clearly go hand in hand. If TransLink’s precedent-setting work can be leveraged, we have an opportunity to cut costs and pollution in communities throughout B.C. And after all, whether you walk, cycle, take transit, or drive, who’s not for cleaner and quieter city streets?